The Aesthetica Creative Works Competition is open for entries! 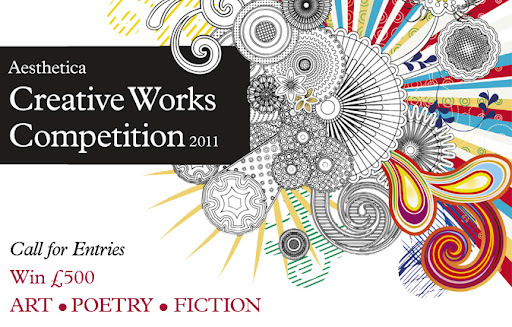 With categories for artwork, poetry and short fiction, the Creative Works Competition provides a great opportunity for artists and writers from a range of disciplines to showcase their work to a wider audience and nurture their reputations on an international scale. Previous finalists have achieved success and recognition with accolades including: writing commissions from Channel 4, selection to represent Australia in the Florence Biennale and exhibitions at various galleries including DACS (London) and Flores Fine Art Gallery (New York). Our most recent Artwork winner, Marcus Jansen, was selected by Absolut Vodka as one of only 18 international artists to participate in their Absolut Blank series. Read our Q&A with the 2010 Artwork winner, Marcus Jansen, here. Now in its fourth year, the competition is dedicated to celebrating and championing creative talent across the disciplines and welcomes entries from poets and short story writers as well as artists working in all art forms, including digital art, sculpture, painting, ceramics, glass, metal, textiles and more! •The Competition has three categories, Artwork & Photography, Poetry and Fiction. •Winners and finalists are published in the Aesthetica Creative Works Annual. •Winners of each category receive £500 prize money (apx. €566/$800) plus other prizes. •Entry to the Creative Works Competition is £10 (apx. €11/$15). •The entry fee allows the submission of 2 images, 2 poems or 2 short stories. The deadline for submissions is the 31st August 2011.